Stevioside is one of the naturally occurring sweeteners, belonging to the diterpene glycoside family, which can be widely applied in food, drinks, medicine and consumer chemicals. It is a good dietary supplement, being non-calorific, thermally stable, non-toxic, with a sugar-like taste profile, and suitable for diabetics, phenylketonuria patients and the obese. It is also non-fermentable, and exhibits anti-carcinogenic, antioxidant and anti-hyperglycemic properties. Stevioside tastes about 300 times sweeter than 0.4% sucrose solution. 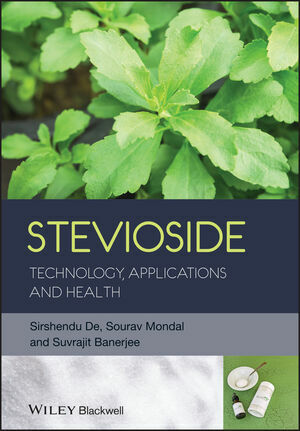 Thus, it offers a reasonably rare combination of health benefits and taste benefits, making the extraction of stevioside is an area of active research for the food industry as well as academic food scientists.With the rapid increase in the popularity of stevioside as a sugar substitute, particularly with regard to its associated health benefits, there is a need for more efficient and feasible extraction processes for stevioside in the near future. This book offers an in-depth look at perhaps the major “sugar alternative of the future”, up-to-date and in line with the latest global legislation regarding its suitability for consumption and its scope for application. Sirshendu De is a professor in the Department of Chemical Engineering, Indian Institute of Technology (IIT) Kharagpur, Kharagpur, India. Sourav Mondal is a researcher in the Department of Chemical Engineering, Indian Institute of Technology (IIT) Kharagpur, Kharagpur, India. Suvrajit Banerjee was Master of Technology in 2012 at the Indian Institute of Technology (IIT) Kharagpur, Kharagpur, India.